Preheat oven to 180 degrees. Grease a baking tin with butter and dust it with flour. Peel, core, and chop the apples into bite-sized pieces. Toss with 1 tbsp lemon juice. Sift flour with baking powder, cinnamon powder, and salt. In a large bowl cream butter and sugar until light. Beat in egg and vanilla until fluffy. Add sifted ingredients to the creamed mixture alternately with milk, beginning and ending with the sifted ingredients. If you are using an electric mixer, combine the flour, sugar, baking powder, cinnamon powder and salt. Add the butter, eggs vanilla extract, and milk and beat until fluffy incorporated. Fold in the raisins and chopped apples. Transfer the batter into the prepared baking tin and smooth the top. Bake in preheated oven for about 35 - 45 minutes until golden brown and a tooth pick inserted into the center of the cake comes out clean. Remove from oven and place on a wire rack to cool. Serve warm with softly whipped cream or vanilla ice cream. Cake looks awesome Shaami !! 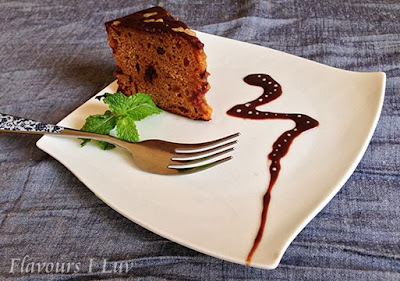 Apple and raisins together should taste yumm love the cake. Love the texture of this cake, I can see the pores, guess how soft and moist it is. You made it very perfectly. Love your space too. Happy to follow you, expect the same from your end too. That piece of cake looks soft and moist. I bet it tastes yummy!! !